Wow! Grateful and humbled by my nomination from Sara AKA FibroButterfly18 who writes the blog The Last Days of Pompeii . Her blog, like mine, is written from the perspective of someone who lives with fibromyalgia and other chronic conditions, but doesn’t let it define her. She looks at each day as a gift and is much happier for it. So check out her blog. And before I could even get this blog post finished, I was also nominated by LadyFibroWarrior, who was on my list of nominees before I heard from her about nominating me! 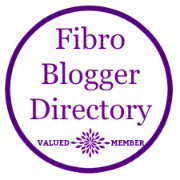 She is another awesome fibrowarrior blogging about life with fibromyalgia and maintaining a positive attitude.